A couple of months ago, one of my usual fabric stalls at the local market had some odd bits of extra fabric. On top of the bolt in their "1 euro a meter" sale corner, they had dumped some off-cuts which had nothing to do with the other fabric they were selling. From time to time, they added more from a big bag. On closer inspection, it looked like they were selling the remnants of some frugal persons stash. There were all kinds of fabrics but most of them looked a bit dated: No stretch, old-fashioned curtain-like lace, quirky prints and either cotton or particularly nasty and easy to recognize synthetics. And all of them small pieces, 1.5 m at most. I picked up a piece of sturdy mid-blue denim, thinking I could always use that. It cost 1 m and when he packed it, the seller stuffed the bag with other small bits of fabric I had shown a bit of interest in (they are fun, actually, but so small it is hard to come up with a project for them). When I bought that fabric, it was summer and I didn't want to think about sewing jeans. Now, it time to think about it. Since I bought it, I thought I had exactly 1 meter of this fabric. 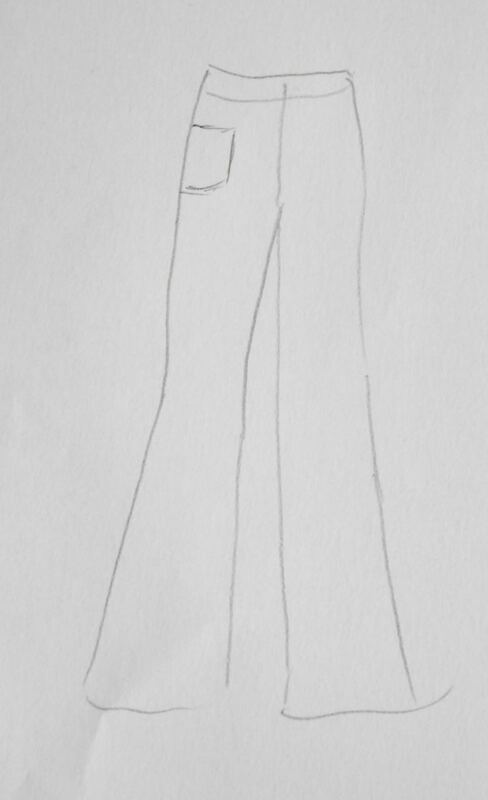 Which would be just a bit too short to myself a pair of trousers (I know I've made a lot of tapered ankle length ones but that really requires a slightly sloughy fabric). This particular denim is really a bit old-school: Mid-blue with a white weft, a dense twill weave and quite thick and sturdy. For a while, I've been telling myself I would use it to make culottes. The kind that has been in fashion this past year: Well past the knee and a bit more trouser-like than the vintage variety. Or plus-fours. There is a little more fabric than I had thought. 1.10 meter. 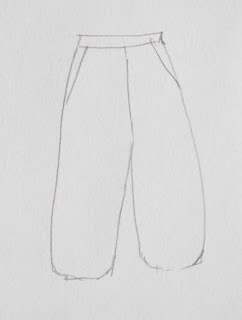 Just enough for full-length trousers if I pick a design without extra details and lay it out carefully. Which also means that big flares won't be possible. I will probably be more of a boot-cut. 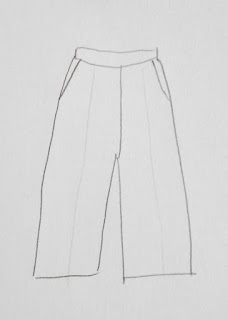 And then, I googled "culottes" for this blog post. 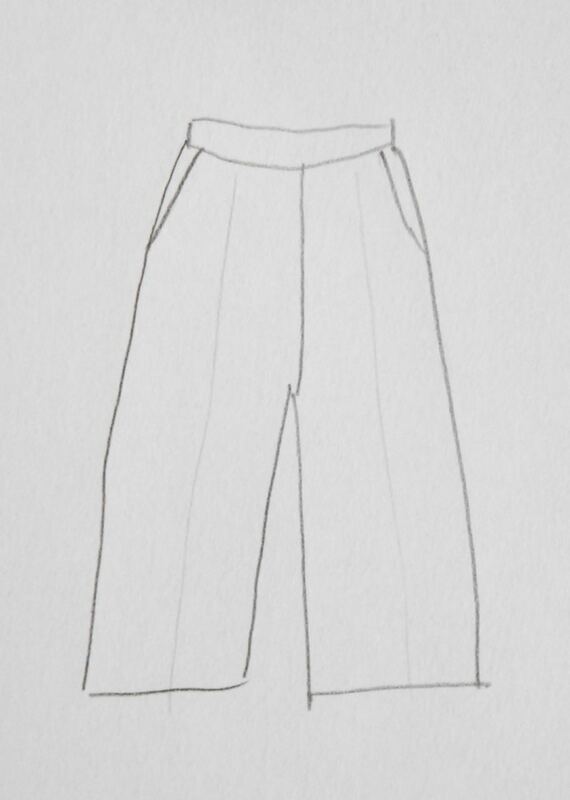 I'm not a huge fan of a lot of mainstream fashion but modern culottes are nice. 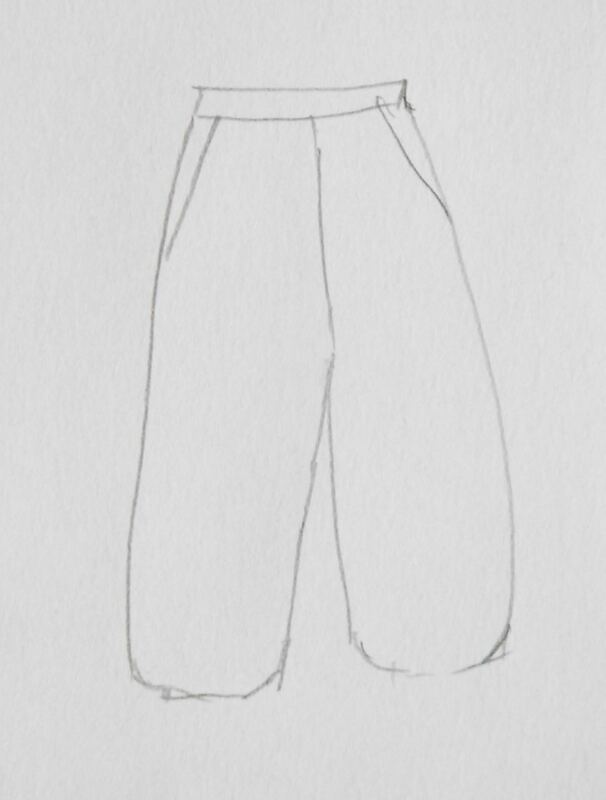 They fit to the natural waist or just below it and most are more properly culotte-like than I had thought. They may or may not have the center pleats I used in my very skirt-like culottes years ago and the shape at the outer leg is usually straight or A-line. Many have added pleats at the front and only the most trouser-like offerings have front fly. I want to make a pair. However, all that lovely fullness means you will definitely need more fabric than "one time the length of the garment" to cut out the pieces for a style like this. So, I won't be able to make culottes like that from this fabric. I know I feel a bit frumpy in 'normal' jeans in this mid-blue. So it has to become something a bit more unusual. 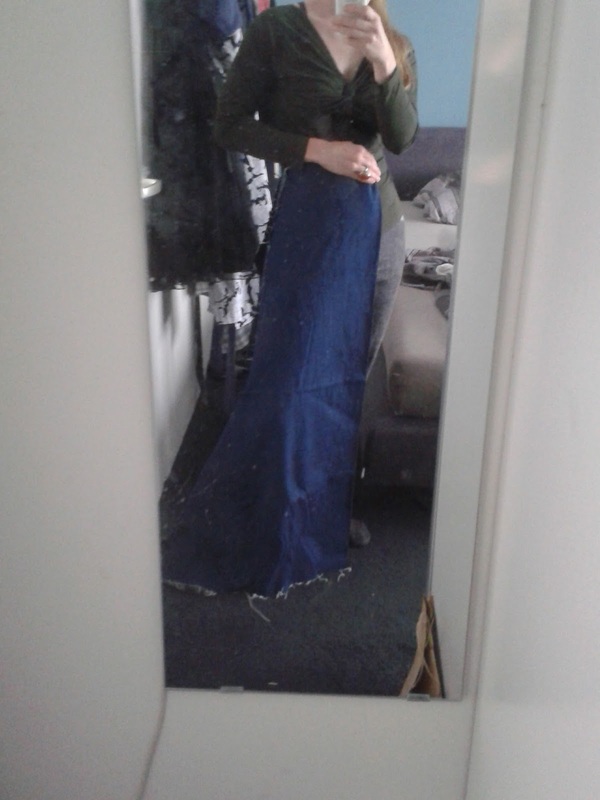 As skirts go, I think this would only fun for a full skirt which would be better with more fabric. It's too thick to think about dresses although a 1960's shift would look good. Oh yes! I love those old Navy uniform bells. I'm in favor of a Celine style culotte, maybe with a The Row (Spring 2015) style wrap closure, or pleats with lapped back/side zip. 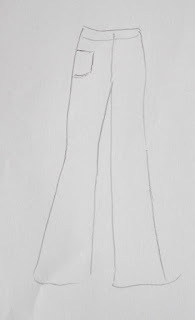 If it were mine, I would make a classic pair of 1950s women's jeans, or dungarees as my grandmother would call them, with red top stitching. How about a pair of 50s style pedal pushers. Short jeans with side zip and above ankle hem with slits at the ankle.